The Tofino to Sooke leg has probably been our hardest. Many days have seen us in the boats for extended periods due either to a singular lack of beaches, or surf on the beaches available. The first day was long, involving a 28+ nautical mile paddle from Tofino into the Broken Group, in weather that became increasingly fine as the afternoon progressed into evening. The next day was very tough. After the better weather the day before we had hoped that it might continue but it was very cold (this must be the coldest June for ages) and there was a south-easterly blowing directly in our faces as we turned away from the shore of Effingham Island and headed for Folger Island, which was on the way to Cape Beale and Pachena Bay. The marine forecast was for the wind to change to a westerly which would have given us a bit of a boost but it never happened and after 45 minutes of battling into the south-easterly we accepted the inevitable and changed direction to head in a more easterly direction towards Bamfield. If one paddles straight into a head wind and the concomitant wind waves there is an energy-sapping jarring that occurs as one crests the wave and then plunges into the trough. There is a considerable easing of effort necessary if one turns only 20 or 30 degrees away from a headwind, particularly if there are appreciable wind waves. We did see a couple of great sea arches on Effingham, and the north coast of Diana Island, in the Deer Group, which we would not otherwise have seen had we not changed course - definitely worth a future visit. In Bamfield we were looked after by the artist Linda Haylock and her husband Cliff Haylock, who live at the end of Bamfield Inlet, and Linda's sister Marie. Jonathan knows Linda and Cliff from cross-country skiing at Mount Washington. With only 40 minutes notice they welcomed us into their home and allowed us to de-gunge and then fed and watered us. Marie produced a wonderful vegetarian spaghetti bolognese and in the morning a fabulous breakfast. We are so grateful to all three. Our day for rounding Cape Beale and setting ourselves up for the journey along the Juan de Fuca Strait was very memorable. In Doug’s words, “Our best viewing day” yet it was only 13 nautical miles from Bamfield to our campsite in Pachena Bay. As soon as we were out of Bamfield Inlet and heading towards Cape Beale we started coming across some great rock gardens, the kayakers’ term for rocks and channels that one can paddle around and into. The key is to time entry into channels with the movement of the swells and breaking waves. Cape Beale has the reputation of being one of the most testing bits of the west coast, with a number of shipwrecks over the last 200 years, but, as was the case with Cape Scott, Cape Russell, and the Brooks Peninsula, we were lucky with conditions. Some decent sized boomers but rather than having to go so wide that we could not appreciate them, we were able to paddle up close and to really enjoy their power. As we crossed Keeha Bay, before reaching Pachena Bay, we suddenly found ourselves very close to two or three (we never determined which) gray whales which swam around us for 20 minutes. Being downwind of one of them as it blew only 20 or 30 metres away, Jonathan learned first hand about cetacean halitosis. Whale breath is foul. 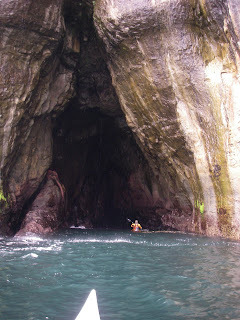 We watched enthralled and got a couple of great photos before paddling on to Pachena Bay. We had not finished our discoveries. On the southern side of Pachena Bay, a mile or so from the beach, is a large sea arch that we spent some time investigating. We found that it actually had not only the main arch but two smaller arches leading into the main chamber. It was a great find. Continuing on our way towards the eastern end of the bay in search of a campsite we spotted a waterfall tumbling directly onto the beach. To make it a more perfect picture, a black bear wandered up to the waterfall for us. The following day was frustrating. The wind was forecast to move to the southeast and to rise in the afternoon but we felt we had time on our side and would be able to make it to Carmanah. However, there would be few possibilities for “outs” if conditions worsened, as all of the beaches on the way would be exposed to winds coming from the south and would have surf on them. We had only been on the water for an hour and a half when it was clear that the wind was freshening much earlier than predicted and listening to the Coastguard broadcast confirmed this. A revised forecast had been issued. We were heading into a gale. We paddled back into Pachena Bay and headed for the commercial campground on the First Nations reserve, expecting to have to stay there for a day. In fact, the gale blew through quickly and the next day we were back on the water and heading for Carmanah. We encountered strong southerlies again north of Pachena Point, and lots of clapotis, but realized that this was partly a “point” effect. Points tend to concentrate both wind and wave energy. Moving further out from points can help one escape these changes and this proved to be the case at Pachena. Once past the point we had much less wind against us and just put our heads down for the rest of the day. After nine uninterrupted hours in the boat, and a total mileage of more than 21 nautical miles we reached Carmanah. Carmanah beach contains one of the west coast’s little oddities. For a number of years a French-Canadian woman has run the eponymous Chez Monique establishment, supplying burgers, beer and breakfast for hikers doing the West Coast Trail. A semi-permanent structure of logs and tarps, and a garden, await those who make it to the beach. Apparently they only see about four or five kayakers a year on the beach, which surprised us. 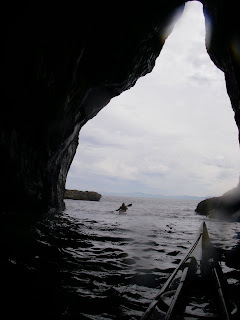 The second of our days paddling the San de Fuca Strait was the Carmanah to Port San Juan leg. The Strait is not really a paddling destination. There are some interesting geological formations but basically it is a very long straight section prone to strong winds which, to be honest, we agreed was going to be more a matter of getting done rather than enjoying enormously. Whilst this is pretty much how it worked out for us, this leg did include one of our great finds, which does not appear in any of the paddling guidebooks although we suspect it is well known to south Island paddlers. About a mile before Port San Juan is a cave complex. 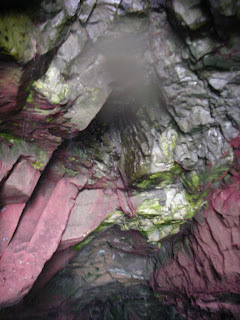 The middle and right hand caves, each about 50 metres from mouth to rearmost section, are joined at the back. The middle cave has a chamber wide enough for a kayak to be turned so that, having paddled down into one cave one can paddle out of the other. The colours within the caves are gorgeous, pinks and reds and greens, and the white flashes on the sides of the pelagic cormorants nesting on the walls add an additional dimension as they fly past. We camped at Thrasher Cove, which is either the first or the last night’s stop for West Coast Trail hikers, depending on whether they tackle the trail in a northerly or southerly direction. The cove is really just a sliver of sand and must be a major part of why only a set number of hikers are allowed to set out on the trail each day. There is not much room. Whilst we were there we re-met a couple of hikers, an Ecuadoran girl and her Swiss partner with whom Doug had chatted at Pachena Bay, the other end of the trail. They had hiked the trail in three days. It takes most people five to seven. We were not surprised to learn that in Ecuador she is a mountain guide, but where a young rather slight Swiss winemaker summons up the energy to crack the Trail in three days we could not work out – “And we still had time to lie on the beaches”, they told us. Our last two days were spent taking advantage of following seas thanks to obliging westerlies. This part of the Strait runs basically west to east, which is slightly counter-intuitive for those of us who think of the island as having a north-south lie. The same is the case in the Queen Charlotte Strait in the north, of course. The winds in the Juan De Fuca Strait tend to rise in the afternoon and we had quite a ride into our last campsite of the leg, at Jordan River. The last day the winds were less vigorous but the paddling was made more “interesting” by the fact that one of the boats lost its skeg. The skeg is usually fully lowered in following seas to improve “tracking” which is the straight-line travel of the kayak. Without the skeg down a kayak tends to veer to right or left as waves coming from behind, but slightly to one side, make the boat broach to that same side. It takes much more effort to control a skegless boat in following seas but it certainly helps in skill development. The remaining skeg was raised in sympathy and we had a testing couple of hours paddling to Sooke. There at Whiffen Spit was Penny Dutton, armed with Coca Cola and Miss Vicki’s salt and vinegar chips, our favoured first meal at re-supply. Anne and Clare Reggler arrived within moments of our beaching. The last resupply before our return to the Comox Valley was underway. thanks for the interesting read and the amazing pictures. have a save journey home! CANNOT WAIT to hear about your trip once I see you next month in Rochester NY! p.s. Bring every single picture you took. The one's posted are breathtaking.